On this day, the town of Springhill, Nova Scotia experienced a terrible mining disaster. A collapsed mine, triggered by a ‘bump’, would claim the lives of 74 men. The story of Maurice Ruddick and the five men who he saved, however, would live on. In Beau Dixon’s one-man show Beneath Springhill: The Maurice Ruddick Story, Dixon celebrates Ruddick’s unyielding spirit in the face of disaster. A beautifully woven tale of heroism, Dixon skillfully pays tribute to a man whose music and faith gave him the strength to inspire others. A husband and father of 12, Ruddick works as a coal miner to support his family. Though his dreams of being a musician have long been put to the wayside, Ruddick is not shy to share his passion for singing with his co-workers. Unfortunately, Ruddick, an African-Canadian, is not always welcomed by the men he works with. When news of the mine collapse breaks out, Dixon imagines what Ruddick’s 10-year old daughter Valerie experienced when watching live television coverage of the event. The coverage is hosted by a CBC reporter who Dixon also plays. Trapped at the bottom of the mine with six other men, Ruddick is compelled to keep their spirits high until the rescue teams reach them. He does so by singing and leading the men in various hymnals. Even though the men’s morale drops with each passing day, Ruddick is firm in his resolve. Beneath Springhill is a moving piece of drama that succeeds in portraying Ruddick as a man who did not see himself as a hero, but someone simply doing the right thing. Someone guided by not only their faith, but their basic humanity. (The real-life Ruddick would go on to play down his hero status). Ruddick’s admirable character as a family man and a hard worker is, in fact, what drives the emotional impact of the play. Dixon never allows us to forget how easily Ruddick could have lost all hope. It is truly gut-wrenching to watch the trapped men resign themselves to death while Ruddick pulls what little energy he has left, setting aside his own fears in the meantime, to maintain their morale. And all the while, who is Ruddick? He is just a simple man who risks his life on a daily basis to put food on the table. Nor does Dixon allow us to forget how Ruddick was later rewarded for his courage. Because of segregation at the time, Ruddick’s invitation by the Governor of Georgia to a luxurious resort is sent under the condition that he and his family stay in a trailer park, away from the other survivors. Under the hot theatre lights, we can see that this production is not easy for Dixon who plays a wide range of characters. Yet, despite the furious pace at which these transitions happen, Dixon somehow manages to not lose control of the distinct voices and mannerisms he has crafted, especially those of the five coal miners trapped with Ruddick. Also, Dixon does well to keep the play moving forward by framing the central action with scenes of Ruddick’s daughter and the CBC’s coverage. Despite Dixon’s mixed performance as a 10-year old, seeing the disaster through a young girl’s eyes is still heart-breaking. And the CBC’s (rather pessimistic) coverage of the event reminds us just how great the odds are/were against Ruddick and the other coal miners. A story about hope, family, and humanity, Beneath Springhill: The Maurice Ruddick Story pays its respects to a Canadian hero who inspired strength in others. Audiences will find Dixon’s performance as incredible as the emotional story he brings to life. 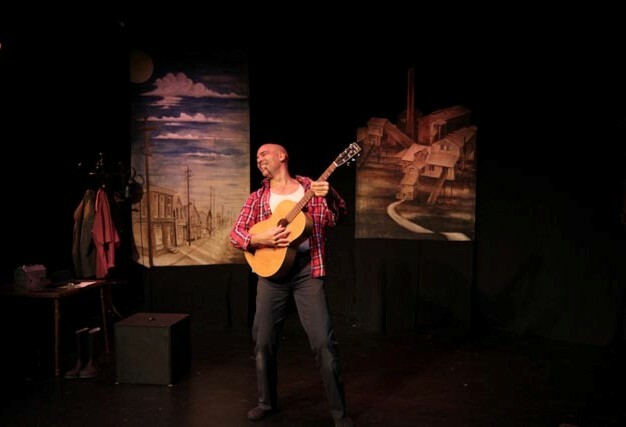 Beau Dixon’s Beneath Springhill: The Maurice Ruddick Story runs at Lunchbox Theatre Jan 12 – 24, 2015. ‘Beneath Springhill’ is co-presented with the 25th Annual High Performance Rodeo.